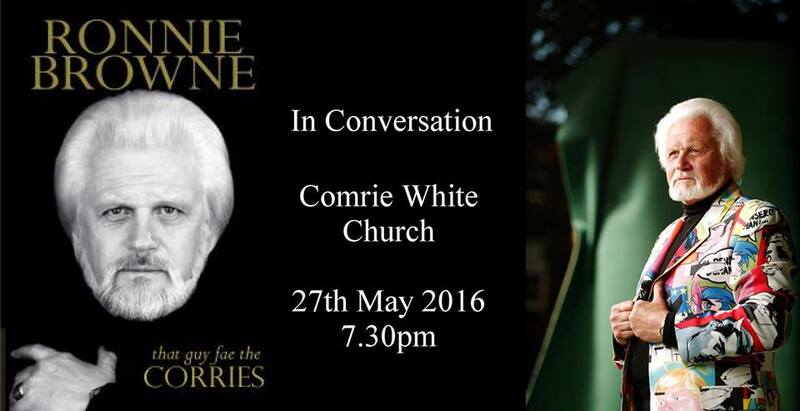 Come along to the White Church Community Centre for an evening of conversation with Ronnie Browne. Much more than “That Guy Fae The Corries”, hear Ronnie talk of his whole life from childhood to present day, with tears and laughter along the way. From growing up in Edinburgh, through joining The Corrie Folk Trio and Paddie Bell, and singing “Flower of Scotland” at the Commonwealth Games Opening Ceremony, to his parallel career as an artist and finally writing his autobiography. This should prove to a a lovely, intimate, and highly entertaining occasion with the chance to speak to Ronnie. Books will be available, as will Corries and other memorabilia. Tickets are £12.50 from White Church or Hansen’s Kitchen in Comrie.